Ray Dalio is a particular man. He founded Bridgewater, the world’s largest hedge fund, which manages over $150 billion. 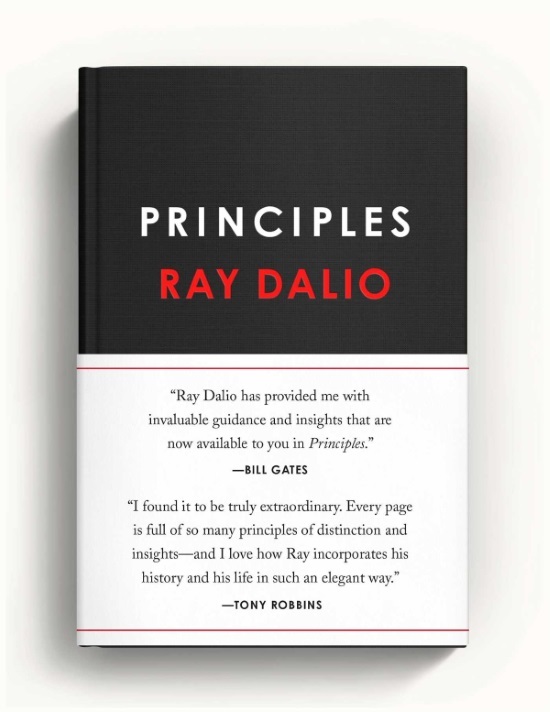 As of right now, Ray is worth more than $15 billion, and also the author of Principles, the NYTimes best seller. 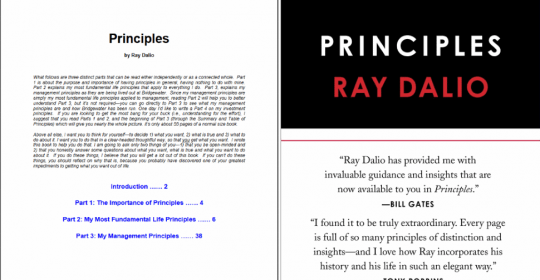 But this story isn’t about Ray – it’s about how Principles became a book in the first place. It’s a story about generosity and taking what resources you have to seek a more enriching life. Ray gained fame after the 2008 market crash; he had shorted the market and made a killing. Following the market crashing and Ray’s windfall, people hounded him to understand how he did it. People wanted to know the fundamentals on how Ray operated. Listening to the people, Ray wrote Principles. When I say write, I mean he wrote out his thoughts in Word and posted it online as a PDF. The information was substantial and novel. Quite a few would go so far as to say it was incredible. But: the production quality did not match. You know how an indie film can become a darling with the critics and subsequently a cult classic? That’s what Principles became. The original PDF was a file you had to go looking for. The URL was something akin to bwater.com/file_upload/principlesdraft3.pdf and no official site or page existed. It was never marketed or promoted, but the wisdom contained within made it a viral hit. Eventually, over 3 million people would download that PDF on word-of-mouth alone. One of those readers was Phil Caravaggio. A man who would call that PDF extraordinary and life-changing would do something extraordinary himself. 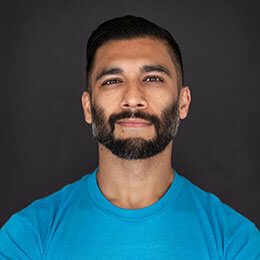 Phil’s co-founder Dr. John Berardi is a leading figure in the health and fitness space – he advises companies such as Apple, Nike, and Equinox, and has worked with clients such as MMA fighter Georges St-Pierre. Their partnership is a marriage of complementary skills. John is the face and brings the nutrition knowledge, and Phil brings the underlying business and processes savvy. The company exemplifies bootstrapped success – 16 years old, reliable mid-8 figures revenue, and I often cite them as an example of “professionalism” (something severely lacking in the health and fitness space). I consider myself fortunate to count both Phil and John as my friend. Phil is the co-founder of Precision Nutrition, a powerhouse in the nutrition space. So back in 2014, Phil comes across a video featuring Ray (How the economic machine works). Blown away at the information presented, he goes seeking more information on Ray and comes across his PDF. By the time he finishes reading, Phil has realized he’s stumbled upon a goldmine of knowledge. Most people writing about business have never done what they’re talking about, and here’s this guy who, in the midst of running this business at the highest level, documented how they did it. For most people, this would mean sharing it on social media. For the more enamored, this may mean writing an email or article about it. Phil decided to leverage his assets and go one step further. So Phil goes out and hires a proofreader. He tells him to go through the PDF and to clean it up; the goal here was to clean it up a bit to make it timeless. Phil then turns to Rodrigo Corral, a famous and renowned book designer who has designed award-winning books for peeps like Jay-Z, Chuck Palahniuk (he of “Fight Club”), and more. Together, they produce the original book form of Principles. I’m kind of hand-waving over all of this, but it was hard work. Phil didn’t just hand it off to them and let them run with it; he was actively engaged in cleaning it up and putting it all together. Originally thinking it would take a few months, it took Phil nearly a year to get a finished book in his hands. 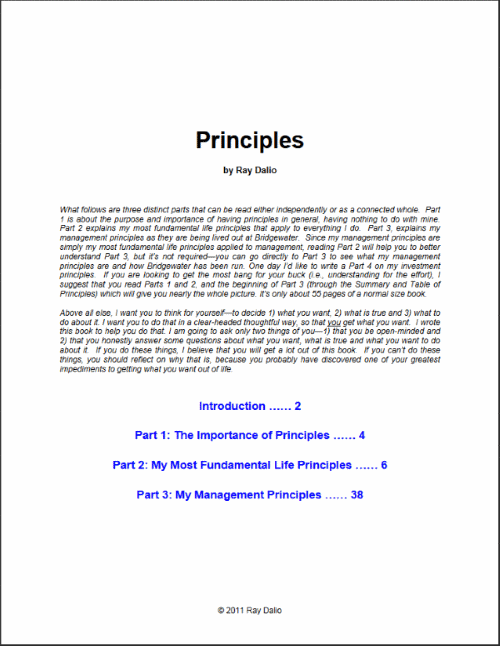 Phil found Principles so life-changing that, as an expression of thanks, he had it cleaned up, designed, and put together as a book. The easy part over, a bigger challenge awaited Phil: how the hell does he get the book in front of Ray Dalio himself? Phils spends months and months trying to find someone that might have a connection to Ray. Someone (Person A) who had applied for a job at Precision Nutrition heard of Phil’s project. Via LinkedIn, Person A found another person (Person B), who had worked with someone (Person C), who had gone to school with someone (Person D), in Ray’s office. (I had to letter the people so you’d see how stretched out and tenuous the connection was). Person D gets connected to Phil, and not knowing what to think, asks if they can meet in Connecticut. So Phil flies to Connecticut and meets her in a garden center that has a coffee shop. The person informs Phil that she cannot promise anything; she can get Ray to see the book, but what happens after that is entirely out of her control. “That’s fine; cool” says Phil. He just wants a shot to get the book in front of Ray. She then wanted to why what Phil was trying to do. Was he a publisher? What was his angle? Phil wants to build a sizeable company, and how better to do it than receive mentorship from someone who has already done it? But that was a secondary concern. The primary goal was to show appreciation to someone who had fundamentally changed his outlook. It was about not resisting a generous impulse, no matter how crazy it seems. Days turned into weeks, weeks turned into months, and Phil hears nothing. Phil assumes nothing will happen. One day, Phil is vacationing in Italy. His phone rings; caller id says the call is from Connecticut, and he picks up the phone to hear Ray’s executive assistant on the other side. The reception is really weak, and as Phil tries to find a better connection, Ray gets on the phone. Ray was over the top complimentary. About how it’s amazing and how beautiful it is. He tells Phil that he wants to do something with it, and Phil offers to help. Ray takes him up on it, and Phil and his wife fly down to Connecticut. And that is how Phil Caravaggio played a part in helping Principles go from a simple PDF to a legitimate NYT Best Seller. Phil wanted to show his appreciation for something he valued highly; instead of thinking “this is crazy,” he made it happen. But what about ME (aka you)? Phil spent over $50,000 converting that PDF into a book (his logic: if you’re going to do it, do it right). That’s not something I could afford to do without mulling it over. With that said, I did spend over $7000 making the NYC Chocolate Chip Cookie Off happen. It’s not about the $50000. Or the $7000. It’s not about the time or the people we know. The point is that we both used the skills and assets we had available to ourselves as leverage to make something we cared about happen. I mean, Phil had to go four-levels deep to find a way of just getting something to Ray… not even an actual introduction! And even that took months and months. We worked within the realms of our means. For example, anytime I come across something interesting, I share it. Not only that, I almost always reach out to the author (via email or twitter) to let them know how much I enjoyed it. That’s me not resisting a generous impulse. Read a great book that you think someone will enjoy? Send it to them! Ryan Holiday and Shane Parrish have both talked about how often they buy books). It’s not about the money; it’s about the thought. A $10 cocktail or a five dollar chocolate can be very meaningful. > If it’s within you means: never resist a generous impulse. I didn’t just say it; I insisted we go and that it would be my treat. We went to Le Gourmand, and I spent a grand total of $6.00 to purchase two cookies. To use Phil’s phrase, “I didn’t resist the generous impulse” (mine: “this cookie is delicious and others need to experience the deliciousness”). All from spending $6.00 (in Canadian dollars!) over two years ago. People come across my love for cookies and think I’ve got some ulterior motive; that my affinity for cookies is some exercise in personal branding. But then they meet me and then they understand – I just love sharing stuff I like. Cookies. Chocolates. Food. Dinners. Books. Stories. Connections. Random gifts. Hell, I just spent $300 taking a buddy’s book (that had a positive impact on me) and getting a beautiful leatherbound version made of it. It’s never about a master plan. It’s never about “what will I get back?” It’s about (and this will sound cliché and very life-coach-ish) giving back and making a positive impact. You don’t need to have a grandiose plan to “change the lives of millions of people”. You don’t need to be some inspirational and aspirational figure that everyone adores and loves. Just a bit of generosity goes a long way. For me, it means trying to live every day with what the hippies and self-help gurus call an “abundance mindset.” It means pushing away the feelings of insecurity, competition, fear, and scarcity, and embracing the fact that there’s enough for everyone to go around. The pie is big enough for everyone to have a piece. And the only true way to get ahead is to give. Because the more I give, and the more gratitude I show, and the more I try to help, the happier I am. It’s not about karma. It’s not about a balance sheet investment – “give, and you’ll get 10x back.” And it’s not about showing off your generosity. It is about sharing whenever you want, and letting anything you get out of it be a byproduct, not the expected result. 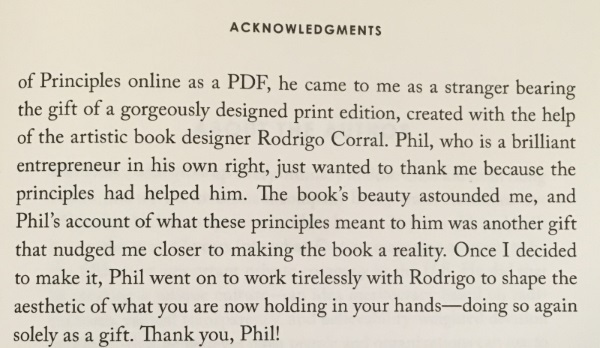 Stories like Phil helping Ray convert his PDF into a book comes with that experience. Learn from my experience. Leave behind the people trying to sell you their consulting or coaching gigs. Join the SJO Fam for real-life experienced advice and thoughts.